2 What does an Administrator do? The aim of this document is to give a brief introduction to the tasks needed for the day-to-day running of a Joomla! site. It is one of a series of documents introducing Joomla! version 1.5. Everyone: who needs to look after a Joomla! 1.5 site. It is written on the assumption that you have used the Back-end and have some initial experience of setting up a simple Joomla! site. Who does the work depends on the site. Day-to-day administration and development are sometimes done by the same person but often done by different people because different skills are needed. For a general site, perhaps for a club or small organisation, one person is likely to do most of the work. For a larger site, there will be specialists for many of the functions needed. This document focusses on the day-to-day running of a relatively small site. Cross Reference: The advanced aspects of managing and extending a site are not dealt with in this series. For links and further information on other web sites, see References. Not everything is done every day - obviously! The majority of the work is done using the Back-end of the Web site but sometimes it is necessary to login to the server on which the site is hosted. Make sure that your username has appropriate permissions. Super Administrators: Can do anything and in particular they can alter configurations and install new extensions. Administrators: Can do most things, apart from installing extensions, altering site-wide configurations or the Super administrator user accounts. Managers: Can login to these pages but are limited to the main menu and managing the content. It is obvious that administrators need to be aware that they can alter content anywhere on the site and can change how the site functions, so their role is important - even if it is hidden from the Front-end. There should be a policy for allowing different users different levels of access to the site. This is to protect the site from accidental damage and 'hacking'. Security is clearly more significant for commercial or business sites. Have short usernames without spaces that people can remember but are not names and do not indicate an administration role. Thus 'admin' is not a good username. Make passwords strong - with numbers, lower and upper case letters. Give people the permissions they need to do their tasks. If people are just adding content, do not give them any of the back-end permissions. You may want to make everyone who is going to add content at least an editor so that they can edit unpublished material. There are advantages and disadvantages in allowing people to register for the site themselves. The choice here depends on the purpose of the site and how many registrations you expect. Set Allow User Registration to Yes if you want visitors to be able to register themselves or to No if you do not want them to self-register. It is here too that you choose the New User Registration Type. It defaults to Registered and so people who register themselves have to be given further permissions if they are going to edit or add content - or be an administrator. Contacts are not the same as users. They are a listing of people that it might be useful to keep in the web site. The important thing about this is that you can use the name of the contact to link to an email address in an article without actually showing the email address. This can add to the security of some sites. You can also link contacts to registered users. The Contact facility allows you to add and maintain contact information, such as name, address, phone and e-mail. The Contact Manager is selected from the menu. The Contact manager has the familiar options, including creating new contacts. The amount of detail that is needed will vary according to the purpose of the contacts for the particular site. There are also many options to display the information. 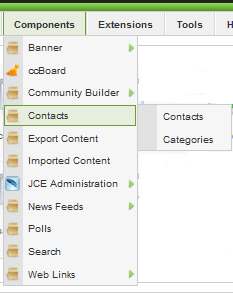 Note that Contacts are sorted according to Contact Categories. These too are managed from the Components menu shown above. You do not need a lot of these unless you have a lot of contacts, but you do need to add at least one Category for your Contacts before you can add your first Contact. You have already worked with the Manager interfaces as part of setting up a site. See Hands-on setting up a Joomla! 1.5 site The best way to become familiar with the detail is to use the facilities and rely on the on-line Help for descriptions of what choices there are. The Article Manager is where you can add and manage all the articles for your web site. You can publish, unpublish, edit, archive and much else. This is where you can alter the Section and Category of an Article and also delete unwanted content. The Front Page Manager is the place where you control which Articles are displayed on the Front Page and in what order they are displayed. The Front Page is often the Home page of a web site, but it can be any page in the site. The Front Page is created using a Menu Item with the Front Page layout. The Section Manager is the place where you can edit existing Sections and create new ones. The Category Manager is where you can edit existing Categories and create new ones. The Menu Manager allows you add and alter Joomla! 's menus. You can re-position menus within the menu heirachy here too. The Media Manager is a tool for uploading or deleting files in the /images/ directory on your web server. You can upload new files, delete existing ones and create sub-directories on the server hosting your web pages. Part of the screen of the Media Manager. The Upload button is at the bottom of the screen. The Manager allows you to view the files as icons (Thumbnail view as shown in the screen shot) or as a details list called Detail view. You toggle from one to the other as needed. The workspace on the screen shows a list of items and shows the contents of the /images directory within your installation of Joomla! 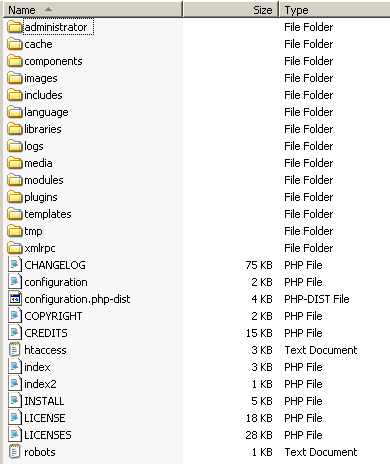 The files and folders are also listed to the laft of the screen. The Media manager can be used to upload image and other file types to the Image folders on the web server. Note that the maximun file size limit can be altered in Global Configuration. Global configuration sounds rather grand and in some senses it is because it is here that you will find all the settings to configure the Site, connect to the database and configure connections to the server. The details are set when the Joomla! site is installed and thus they are best left alone! But there are a couple of things that you might want to alter. For example, you can set an editor as the default under the Site options. The Global Configuration Manager allows you to configure the Joomla! site with various settings. This shows the System Settings: there are also choices for the Site and for the Server. A few of these can usefully be changed to allow the site to be set up as you want it. Alter the Server settings at your peril! An example of the System settings. These are the defaults that ship with Joomla! This shows that a large number of file types are allowed. These can be removed or added to - depending on the site. You can also alter the maximum file size for uploading files here. 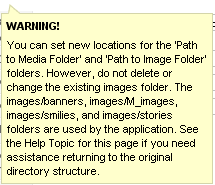 Read the Warning message if you want to alter the location of the image files. For full details - see the Help under Global Configuration Manager. It tells you what everything does, not why you might want to do it. The frequency of backups depends on how often the site changes and how inconvenient it will be to lose any content. The detail depends on how your site is hosted. Ideally you have an automated system that does not depend on one individual pressing the right button. If your site is hosted on a shared server, the chances are that the servers are backed-up reliably but - it is worth checking. Files under C:\xampp\htdocs\joomla15 to be copied for backup. Hosting services normally have a management interface which includes a back-up facility. The backups are normally done by copying all the files relevant to Joomla! and other files in a Home directory. For example, this shows choices for c-Panel, a widely used interface. The Backup Wizard allows partial backups as well as a full backup, and also copies files off the server. In order to backup the site, you must also back up the database. 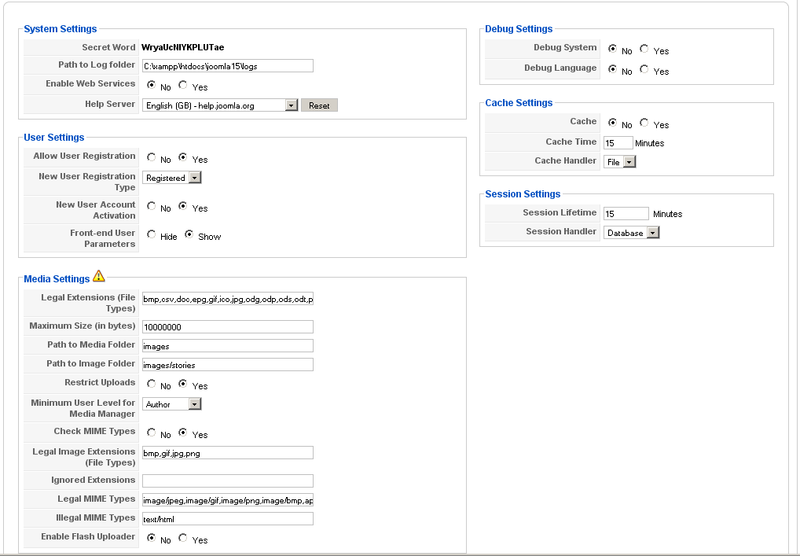 For example, the database management choices for cPanel allow you to use phpMyAdmin interface for this. Akeeba Backup is an open-source backup component for the Joomla! CMS. Its mission is simple: to create a site backup that can be restored on any Joomla!-capable server. Its possibilities: endless. It creates a full backup of your site in a single archive. The archive contains all the files, a database snapshot and an installer similar in function to the standard Joomla! installer. Combined with Kickstart, sites can be transferred easily. There are a number of levels of security and a need for a bit of common sense in having policies appropriate to the purpose of the web site. Help on all the Management pages has a link to the Joomla! documentation web site. In each Manager section Help gives comprehensive information about what all the features do.